Corona limeade. Idris lemon squash. Top Deck shandy. Strawberry-flavoured Cresta. If you spent your childhood in the UK in the 1960s and 1970s, these and many other soft-drink brands of the era will immediately summon up a great frothy wave of nostalgia. Of course, those dimly-remembered beverages that used to be staples of the supermarket and corner shop have long since disappeared. But one such drink has lived on, becoming far more popular in the Caribbean than it ever was in its country of origin. Pear-flavoured fizzy drink Peardrax, along with its apple-based counterpart Cydrax, is still made under licence in Trinidad, nearly 20 years after being taken off UK shelves because of falling sales. Despite the fact that pears are not native to the region, Trinidadians and Tobagonians now see the drink as a defining part of the culture of their twin-island republic. One website, TnTisland.com, features a "True Trini Test" including a preference for Peardrax or Cydrax over Pepsi or Coca-Cola as a sign that "yuh know yuh is a real Trini". And Peardrax is a big seller for businesses catering to expat Trinis around the world. "It's most important during Christmas," says US-based Trinidadian Randall Romero, who runs an international shop online called Trinifood.com. "I know that as a child growing up, that was the main time you drank Peardrax. During Christmas, I would say the Peardrax sale more than doubles - I sell about 100 cases at that time. "Cydrax, we don't sell so much, but Peardrax is popular because it has a unique taste. 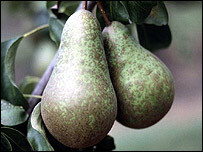 It's the slightly fermented pears that they use - you don't get that from any other drink. It's very good with Scotch." 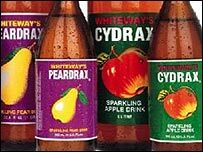 It's all a far cry from the origins of Peardrax, which began as a sideline for now-defunct West Country cider firm Whiteway's. The company was founded in the East Devon village of Whimple in the 19th Century, but by 1968 it was part of the Allied Breweries conglomerate. Whiteway's parent company kept on expanding, buying food manufacturer J Lyons in 1978 and renaming itself Allied-Lyons three years later. But Peardrax and Cydrax were in terminal decline in the UK and were finally withdrawn from the domestic market in 1988. 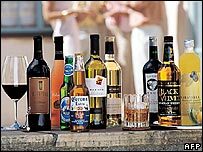 Allied-Lyons went on to become Allied Domecq, which was eventually bought by Pernod Ricard in 2005. 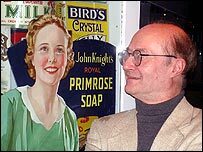 In the meantime, although Whiteway's product range had disappeared from British shops, control of its brands passed from hand to hand in a series of deals, as the UK cider industry underwent a long and complicated restructuring. Since 2004, they have been owned by Gaymer Cider Company, part of the European arm of US drinks group Constellation Brands. Gaymer, the UK's second-biggest cider maker, is best known for its Blackthorn, Olde English and Diamond White brands. But it continues to receive royalties from sales of Peardrax and Cydrax in Trinidad, where they are produced by the Pepsi-Cola Trinidad Bottling Company. Not everyone in Britain of a certain age remembers Peardrax with fondness. Caustic commentator Victor Lewis-Smith, for one, recalls it as "a foul, resinous, cloying, sweet beverage" without even the "saving grace" of inducing drunkenness. But in the Caribbean, as a spokesman for Gaymer says, it is seen as "a more sophisticated drink" that can even be served at weddings to toast the health of the bride and groom. Robert Opie, director of London's Museum of Brands, Packaging and Advertising, says Peardrax is one of many brands that have died out in their home market, but still enjoy success elsewhere. "Lifebuoy soap, for instance, disappeared here about 15 years ago, but it's still thriving in places like India," he says. Mr Opie is unsurprised by the fact that people in Trinidad and Tobago have forgotten about the English origins of Peardrax, perceiving it as a local product. "The ownership of brands is fascinating. We all tend to think that our favourite brands come from our country. "Heinz or Kellogg's we tend to think of as British, but they're not - they're American. People have forgotten that Shredded Wheat came to this country from the US. "We grow up to love these things and we tend to think of them as belonging to our country, but they don't."